Extremely fast flat-surface cleaner with re-capture! 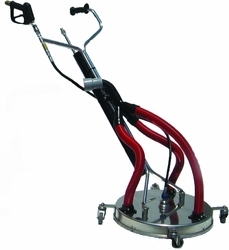 Useful for pressure washing sidewalks, warehouse floors, tile surfaces and more. A perfect match for high-powered vacuum systems like the Sirocco PEV2 and the more-powerful Sirocco gas models. By cleaning the surface and capturing the water all in one step, the time you save will quickly pay for the cost of the equipment. Sanitize when you clean by using hot water (up to 250° F) and leave the floor clean and almost dry! The floor can be completely dry in minutes ! Comes with a quick-connect spray wand for cleaning in the corners - stored right on the handle for quick change-over. Rated for 170 CFM. Weighs just 39 lbs. 4 GPM at 2000 PSI is the minimum equipment requirement. 4 GPM at 4000 PSI makes this surface cleaner really move! 6 GPM at 4000 PSI or more makes this one of the fastest on the market - with approximately 98% capture of the used water (depending on your vacuum system). ▪ To look at non-vacuum surface cleaners, click here!